Interceptor is a monthly, prescription medication for your dog or cat that treats heartworm disease, whipworm, roundworm, and hookworm. 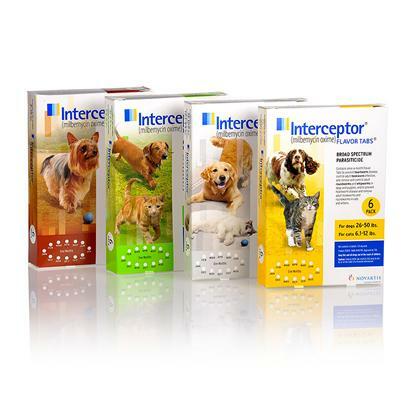 Interceptor will treat hookworms, remove and control roundworms and whipworms in your dog. For cats, it is the only monthly oral medication that guards against heartworms and eradicates adult roundworms and adult hookworms. You can start protecting your pets early because this medication can be administered to puppies as young as 4 weeks weighing over 2 pounds, and cats as young as 6 weeks weighing over 1.5 pounds. It should be given to your pet on a monthly basis, on the same day each month. In addition to being effective, particular attention has been paid to improve taste which makes taking the medication more appetizing for your pet and less of a task for you. Side effects are rare, but can include depression, drowsiness, vomiting, loss of appetite, diarrhea, hypersalivation, seizures, and weakness.